Hamtramck, MI – In the cynical age in which we live, accounts of altruistic behavior by individuals who risked their lives for others during World War II should be especially welcome to readers. In wartime Poland, unlike in other German occupied countries, gentiles who extended any form of assistance to Jews risked execution by Nazis. Despite cultural, religious, and linguistic differences between Polish Jews and Polish Christians, most Poles were sympathetic to the plight of the Jewish people. Hundreds of thousands of Poles sheltered, fed, clothed, provided forged documents and looked after the medical needs of Jews on a regular basis. There were additionally hundreds of thousands of Poles whose assistance, though occasional and indirect, was no less dangerous. “Those Who Risked Their Lives”, compiled, edited and annotated by Anna Poray, offers a glimpse of some of the thousands of Poles who rescued Jews. The book records the names and experiences of many of these remarkable individuals. The Talmud says that he who saves one life, saves the world. Thousand of Jews can bear the witness to the Poles who save their world. 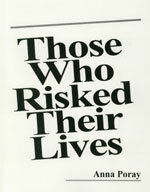 “Those Who Risked Their Lives” was produced by the Heralds of Truth, a Michigan-based organization, and published by IRIS Publishing Services. It is available for purchase (for $20.00) at the Polish American Congress Michigan Division office (11333 Joseph Campau, Hamtramck, MI 48212).